Since some of AngeClub members start domaining using Brandable names, and since they mostly use Brandbucket & Brandpa for that; I see that having an insight in the recent BrandBucket's September data will help us understand more what the buyers are looking for. 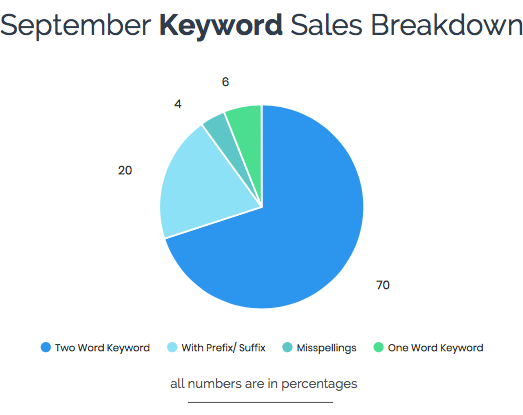 Keyword: The month of September had an uptick of One Word Keyword sales from 2% to 6% as well as for Misspellings from 3% to 4%. 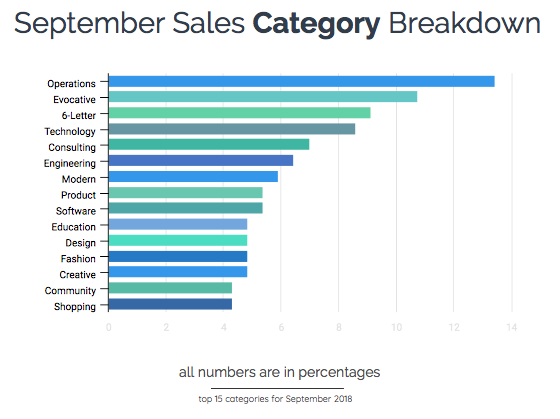 Still holding strong, Two Word Keywords takes the greatest chunk of sales for September. With Prefix/Suffix stayed the same in the month of August to last month. 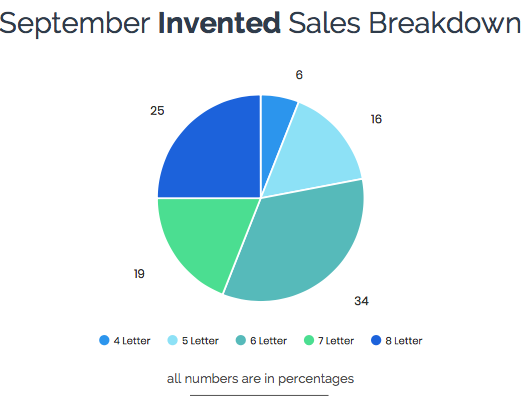 Invented: In September, the highest selling Invented category went to 6 Letter names compared to 5 Letter words being the top in August. The biggest change for Invented names was 8 Letter names sales jumped from 10% of total sales to 25%. Categories: From August to September, the top two categories remained the same. Following the uptick in 6 Letter sales, the 6-Letter category made its way to the 3rd spot. As mentioned earlier, the Education category made its appearance, potentially following the beginning of the school year! We are interested to see how these categories shift during different seasons, holidays and events throughout the calendar year.